Ah, the quest for HQ2. Cities have admittedly been doing some crazy things to get Amazon's attention, but outside all of that flair, a city needs to be judged based on its merits. And as the trend toward ecommerce grows, Amazon--the world's largest online retailer--soon will decide which city to call home for HQ2 (some time in 2018). The competition to woo the company is fierce, given the absolutely massive scope of the business, but there are compelling reasons why Jeff Bezos and his team should cast a serious eye of consideration on Charm City, otherwise known as Baltimore, Maryland. Baltimore is a hub of the East Coast, planted right between other major centers such as Washington, D.C., Boston, and New York City. BWI international airport (the busiest in the region), direct access to I-95, positioned on the water, freight rail, one of the largest mass transit systems in the country and 100 million U.S. residents within trucking range all make Baltimore a prime path for transit and distribution -- something that is complementary to their growing, local distribution presence. Amazon is striving to innovate in dozens of ways, offering not just products, but also improving cutting-edge services like cloud storage, analytics tools, and fulfillment. They're also investing in AI-based resources such as drones and dynamic pricing algorithms. It's little wonder, then, that the company's RFP specifically stressed the need for a highly educated labor pool and the ability to retain technical talent. With a labor force of more than 3 million, Maryland ranks #1 in the entire country for concentration of workers within STEM occupations and has the nation's highest concentration of professional and technical workers. It's also home to skilled manufacturing laborers in nearly every type of industrial job, and Baltimore has been identified as a new tech hot spot. Baltimore was also recently ranked #1 on the 'Top 10 Best US Cities for Women to Start a Business' by Citrix. In addition to numerous public and private primary and secondary schools, the city has not one, not two, but twelve accredited two and four-year colleges and universities. The Baltimore Sun reported that the University System of Maryland's Board of Regents has voted to waive a 12-month residency requirement to qualify for in-state tuition for any Amazon workers--including spouses and children--who move to Maryland, should Amazon say 'yes' to positioning H2Q within the state. Lastly, many areas of the city are undergoing gentrification, drawing huge numbers of talented immigrants. A job at Amazon alone won't keep workers happy--the new HQ2 headquarters also has to let employees and their families feel balanced and connected. The education system, rich historical heritage, and longstanding tradition of baseball, football, and other recreational events go a long way toward this purpose. Museums, markets, parks, and three separate arts and entertainment districts and a nationally-recognized culinary scene further ensure there's plenty to do. Through this culture, residents enjoy a top median household and per capita income, as well as living costs that are significantly less than what they'd experience in other northeast or west coast urban areas. While all of Baltimore offers Amazon incentives, the $5.5 billion Port Covington project with a $660 million TIF already awarded last September, is undoubtedly most attractive because of its building flexibility. The massive initiative is being steered by Plank Industries, the private investment arm of Under Armour CEO, Kevin Plank. 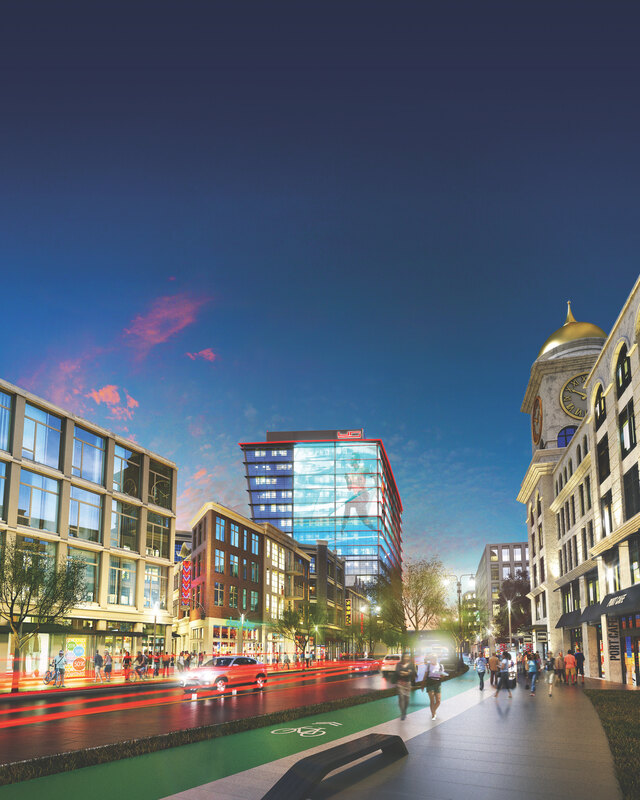 The region, which already has a flexible, environmentally friendly, tech-oriented, mixed-use 235-acre redevelopment project underway, has attracted significant attention and a robust plan for commercial expansion. From this prime location, Amazon could essentially design and build a space from the ground up that meets worker needs while representing its core vision and values -- a location that Goldman Sachs recently invested $233 million into. The peninsula itself is surrounded by 3 sides of water -- allowing Amazon to have a self contained urban campus on the water. You're not going to find a better campus anywhere else in the country. You're not going to get inherent attributes that will be offered -- something that certainly sets Baltimore apart and is already supported by an aggressive development plan. "The view of infrastructure and future technology in Port Covington sets us apart from other RFP respondents. In other proposals, you can expect to see a lot of 'if / then' -- that if you come to a particular city, then we will do X, Y, and Z. One of the integral differences in Port Covington is that we've already made years of progress on the future view of what a smart city should look like. This isn't something we have to start from zero; and we would love to have a great corporate partner like Amazon to get this to the finish line." "Amazon might take a project in another city from 0-60, but with Baltimore, we expect them to take us from 50-90. We have significant momentum already and know the impact it will have on the city & region--Amazon would obviously be not only a huge accelerant to this, but also a beneficiary of it. You can feel the energy that already exists today which Amazon will inevitably fuel as they look to build their corporate culture on the East Coast." "Port Covington is not only the best site in Maryland, it's the best site on the East Coast. I don't think people realize how much Baltimore has grown and we're one of the fastest growing cities for millennials in the US -- with top talent continuing to be secured by the likes of Fort Meade and the NSA, many of which are unsurprisingly chasing to reside in Baltimore. All factors make Baltimore incredibly attractive when coupled with our low cost of living and second-to-none accessibility." "With the raw land, an amazing location that is just screaming to be developed, and the entitlements already in place, the heavy lifting is already done with Port Covington -- it would save Amazon a minimum of 18 months of development and allow them to get started right away. I don't think there's a better site out there that's ready to go." Port Covington is bolted onto an existing city with an incredible, authentic history, deeply rooted in innovation that played a very strong part in American history, located on I-95 -- to say that it's compelling is an understatement. Your move, Amazon. Talk to you in 2018.